I love Joan Jett as much as Joan Jett loves rock and roll. I’ve been a fan for 20 years because everything about her is authentic – her scathing guitar skills, dark eyeliner, ability to wear leather with almost anything, sandpaper voice, and her affinity for the color black. 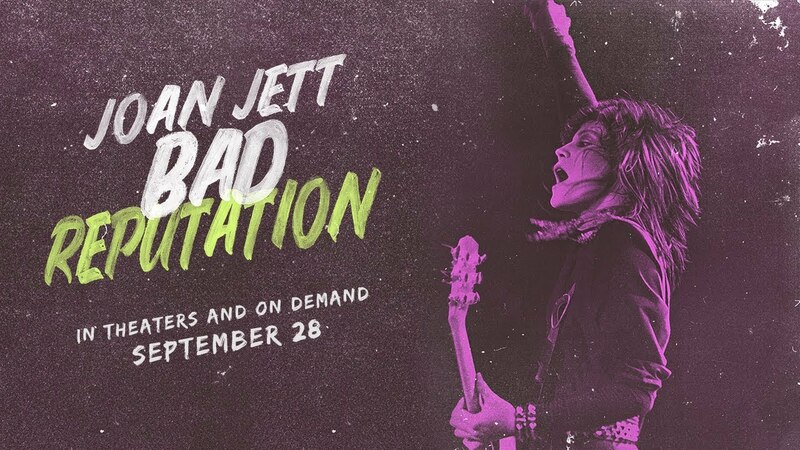 So, of course, I was excited to watch Bad Reputation – the new documentary released last week about her life and career in the male-dominated rock and punk genres. Starting with her parents giving her a guitar from Sears, through her 2015 Rock & Roll Hall of Fame induction, Jett’s story demonstrates that she has been a force to be reckoned with from the beginning. She talks about how in the 1970s no one could comprehend how a band could be made up of all females or how a woman could play rock and roll music with such fervor. I can’t even imagine. Her short tenure with the Runaways ended way before it should have, mostly because they were ahead of their time and because people took advantage of their age and naivety. But also, and this is glossed over in the film’s narrative, the band’s manager Kim Fowley was accused of all kinds of sketchy behavior when he was managing the teenage group. It’s amazing how young they were and that Lita Ford was an original member – I had totally forgotten about that! It wasn’t until Jett met songwriter and producer Kenny Laguna that her career really took off. I love their platonic relationship, as their four-decade collaboration demonstrates an unusual match that was definitely meant to be. Laguna was instrumental in helping Jett form the Blackhearts and ensuring that her career moved in a prosperous direction. Over the years the pair has produced her records, along with many other punk bands they helped launch. The two of them are fun to watch – they act like siblings and it’s clear that their symbiotic relationship, and their odd couple tendencies, is what has made them work so well together for so many decades. Two of the most shocking parts of the film include footage from a television interview and a rejection letter from a record label. In the former, the awful woman interviewing Jett was clearly tries to set her up for failure when she asks if she’s ever getting married or having kids and Jett says no. The female interviewer, who one would think might be more understanding than a male interviewer at the time, could not believe her ears when Jett answered “no” to those questions. She was an abomination to journalism. The latter shows a rejection letter Jett received from a label that says they would not be signing her because they didn’t think any of the songs she sent were hits. I hope the people in charge of that label feel like assholes to this day because the songs they rejected included “I Love Rock ‘N Roll,” “Crimson and Clover,” “Do You Wanna Touch Me” and “Bad Reputation” – four of her biggest hits. In fact, “I Love Rock ‘N Roll” spent seven weeks at number one on the Billboard Hot 100, “Crimson and Clover” was a number one single, and “I Hate Myself for Loving You” spent 26 weeks on the Top 10 music charts. Although I clearly support the success of women in all things, I wonder if Jett steered the thesis of the film based on today’s political climate. There is no question she experienced incomprehensible hatred because she was and continues to be a badass woman in a male-dominated industry, but I think some of her story gets lost in the overarching female empowerment message. I say this with trepidation because Jett is so important to the history of music, women in the music business, and rock and roll in general. She started as a guitar player in an all-female teenage band and became a rock icon. That being said, anyone who is a punk rock fan will enjoy this film – it’s amazing how much Jett did for the genre in the 70s, 80s, and 90s. She helped the Germs get their start by producing their first (and only due to the death of their lead singer) record. For those who aren’t Germs fans, guitarist Pat Smear subsequently played guitar for both Nirvana and Foo Fighters so the grunge era arguably has Jett to thank for giving Smear his big break! Jett was also instrumental in helping Seattle punk band The Gits record an album and raise awareness for women self-defense after singer Mia Zapata was brutally raped and murdered at age 27. Although there was a lot about Jett I already knew, the documentary did an excellent job depicting her reach beyond The Runaways and The Blackhearts. Her contribution to music, feminism, and fashion were and continue to be extremely important to me and countless other fans across the world. To say that she is the hardest working woman in rock and roll is beyond accurate and, at age 60, Jett is still singing, playing guitar, and personifying cool. We should all strive to follow in her leather-clad footsteps.